Warm the olive oil in a large soup pot over medium heat. Add the shallot, cook for a few minutes till it starts to brown. Add the garlic, chile flakes and oregano. Cook for a few minutes. Add the cauliflower. Cook till the cauliflower starts to brown and soften, then add the beer. Cook till the beer is starting to reduce and become syrupy, and add the avocado, the cumin and the coriander. Cook for a few minutes, then add water to cover by about an inch. Bring to a boil, then reduce the heat and simmer for 15 or 20 minutes till the cauliflower is softish. Add the lime juice, honey, butter, salt, pepper and most of the cilantro (save some to stir at the end, or for garnish). Carefully blend the soup in batches till it’s nice and smooth. Return to the pot to warm through, and taste to make sure all the flavors are balanced – sweet, spicy, salty, tart. Serve with a garnish of diced tomatoes and chopped cilantro. 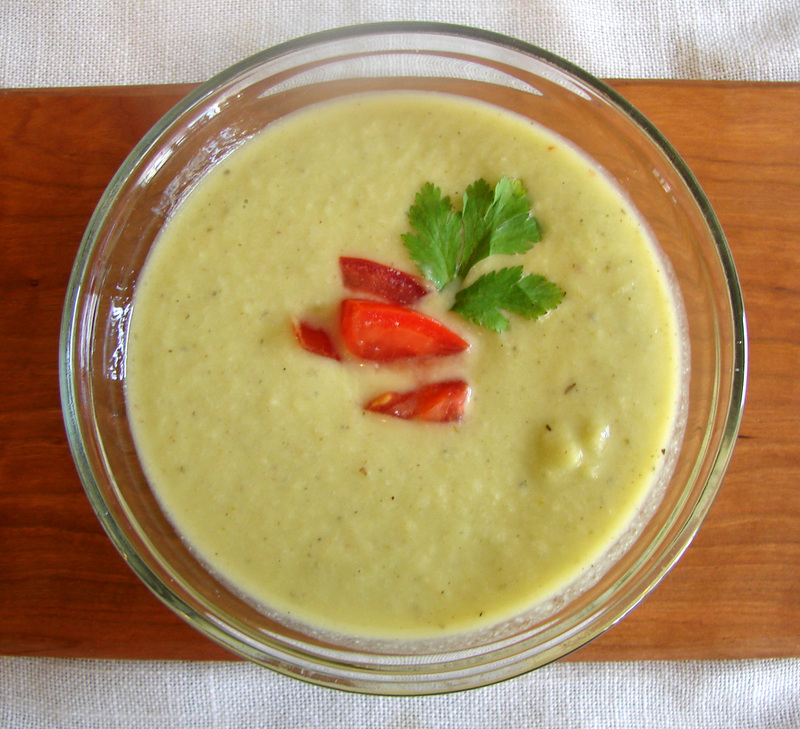 This entry was posted in recipe, soup, tomatoes and tagged avocado, cauliflower, chile, cilantro, cumin, guacamole, lime, soup, vegan by Claire. Bookmark the permalink. I like the picture, I like any picture with red, green and gold! Nice composition with the glass against the teak board and the white linen, A+. Thanks, Tony. You’re photographic encouragement means a lot to me. I’ve been applying to these sites that publish pictures of food, and my list of rejections is getting very long! Still, it helps to push me to try to take better pictures. I love cilantro, as we call it, I’ve grown it many times but the problem is that it goes to seed VERY fast, so ideally the seeds should be planted continously over a period and I never remember. I think that I became aware of it in the 60/70’s with the influx of Thai and Vietnamese into S. California, I just love the smell of it in the garden. Avocados ditto, can’t live in S. Cal and not be aware of avocados. We have a half dozen basket from Costco every week in our grocery shopping so every night there’s a salad with avocados. We’re just a bit too far north to grow them, I think the cut off is somewhere around Santa Barbara. I’ve tried growing cilantro, too. You’re right about it going to seed too fast. I tend to use most of the leaves for one recipe, anyway, so it never lasts long!